A layer of landscape fabric can block the growth of weeds while allowing water and air to reach the soil beneath. Used in a vegetable garden, landscape fabric will reduce the amount of time spent controlling weed growth compared to vegetable gardens not using landscape fabric. Landscape fabric can be 3 to 6 feet wide and 50 to 100 feet long. There is a simple technique to follow to plant vegetables with landscape fabric. Prepare the soil of the vegetable garden, applying fertilizer or compost if desired. Partially unroll the end of the landscape fabric parallel to any side of the garden. Secure the end with rocks, bricks, soil or landscape anchor pins. Landscape anchor pins are 4-inch-tall, U-shaped metal pins used to hold landscape fabric in place. Unroll the fabric across the garden and secure on the opposite side. Cut the fabric. Toss soil periodically along the length of the fabric to hold it down. Start the second strip of landscape fabric parallel to the first. Overlap the layers about 2 inches. Weigh or pin down the beginning and end of the strip. Cut off the excess and continue the process of overlapping strips and weighing or pinning down the ends. Toss soil as needed on top of the strips to hold them down. 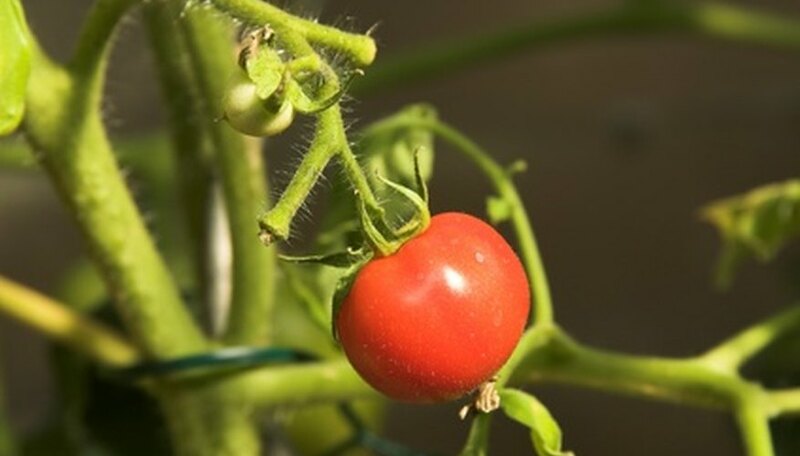 Place container vegetables on top of the landscape fabric in rows, properly spaced apart according to the vegetable planting guidelines, like 2 to 3 feet apart for tomatoes. Use a utility knife to cut an X in the fabric at the location of the plant container. The X should be large enough for the container to fit through. Turn under the corners of the cutout, exposing the soil. Use a hand spade to remove soil, creating a hole large enough to fit the plant pulled from the container (pull the plant from a plastic container; with peat pots, leave the plant in the container). Plant seeds by measuring the planting distance according to the seed pack, like sweet corn planted 10 inches apart in each row. Cut an "X" 2 to 3 inches tall in the landscape fabric. Fold under the points of the "X" cutout and then push the seeds in to the proper planting depth.